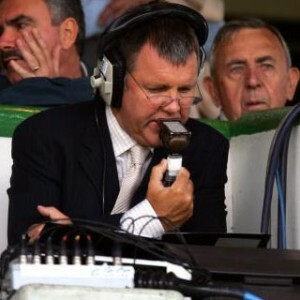 Clive Tyldesley has been commentating on football matches for over 20 years. He's had two stints at ITV with a four year spell at the BBC sandwiched in between. Do you have the best job in the world? It's the job I always wanted to do. According to my parents, I had my heart set on it from quite a young age. I was never ever going to be good enough to play the game to any level, so I guess that commentating is the next best thing. The perks of the job go way beyond getting the best seat at some of the very best games. You are given a pass to 'inside track', and meet players and managers on a personal level. Quite apart from the buzz of getting close to the central characters on the big nights, you get a unique insight into what makes them tick and how they approach their profession. It's that privileged information that you hope to convey during a commentary in order to try to provide the viewer with a better appreciation and understanding in addition to conveying the natural excitement and drama of live football. You've set up a website to help budding broadcasters of the future. How is that progressing? Footballcommentator.org is in a very raw initial state. It now needs input and traffic from those interested in how football is presented by broadcasters in order to make it work. Many moons ago, I wrote letters to commentators seeking advice and encouragement. The idea is to replicate that kind of contact through a 21st century online vehicle. For those hoping to make a career in sports reporting there are all kinds of issues about choosing the right degree courses and seeking work experience. The hope is that footballcommentator.org will address some of these and provide a forum for those interested in the business. Guardian journalist Sid Lowe recently admitted to using Panini football stickers as a way of remembering players faces at the World Cup. What's your preferred method? I did go down the stickers route a couple of World Cups ago, but I think that you can find most of what you need on a lap-top screen these days. We try to get our hands on DVD's of any preparatory internationals before a major tournament, but the players warm-up time in the hour before kick-off is the most valuable time for identifying players. Skin colour, hair colour and boot colour are probably the first three points of reference. Wrist-bands, ankle bands and head bands are all useful too. I guess we subliminally monitor players' shirt numbers because if somebody changes from their regular number it jars on your brain, but the bigger the tournament, the bigger the stadia, and numbers are not always as clear as they might be. The secret is to wait if you're not sure. It's better to identify a goalscorer late than wrongly. How much research do you put in prior to commentating on a game? How much? Enough! People often ask me if I get nervous before games, and my answer is usually 'not, if I'm prepared'. You cannot DO too much preparation. You can USE too much of it. Sometimes, I think certain commntators are saying 'I've bloody well done this reasearch, so you're bloody well going to hear it!'. Relevance is everything. For a big final, you may do an hour's work and more on penalty stats that will only get used if the game is drawn. That's just part of the job. Don't force information on the viewer - use it where and when it illustrates a point or creates a debate. Do you prepare many lines beforehand, or is it all spontaneous commentary during the matches? I will write scripts for pre-match stuff - team captions and presentations before anthems etc. You've got a certain amount of control over all that. Once the first whistle blows, you have got no control whatsoever. How can you script or anticpate the course of a match? A lot of the 'thinking(?!)' I do en route to a game surrounds what the particular questions and issues the outcome of the match will answer, so you are preparing scenarios and trying to cover the bases. But that's all you can do. When was the last time you paid to see a match? I take my 15 year old son to Reading maybe half-a-dozen times a season, but he is as interested in Premiership rugby (his sport at school). I feel a bit strange going to watch a game without a professional purpose. I'll happily go to watch a 'non-league' team ahead of a live FA Cup tie or something, but if I'm at a game it's usually for a reason rather than pure pleasure. How much football do you watch each week? I watch an awful lot of television football. I record hours and hours and work my way through it at times when it does not impinge on my family and social lives. Part of my job is to be 'better' informed than the average viewer so it's important that I'm abreast of most of the football that is out there. Are you one for collecting football memorabilia, and if so, what is your most treasured item? I will keep programmes and entry passes from major games and tournaments that mean something special to me and my career, but no more than that. You spent four years at the BBC during the 90's. Was that an ultimately frustrating time given that you couldn't shift Motty and Barry Davies for the big gigs? Not really because they were both way ahead of me in terms of experience, know-how and probably talent. I had always, always wanted to work for the Beeb so those four years represented a dream come true. They were among the most enjoyable and instructive years of my career, and I look back on them with great fondness. I suppose the day the Commentators' Rota for Euro'96 was published, and I had one live game, on a Friday afternoon between Turkey and Croatia... I kind of knew that I needed to move on if I was to get on, and that is when ITV came calling. ITV was your home before then, and has been since, are you happy with their football coverage as a whole? I'm very proud of most of what we do. I think we have suffered as a result of one or two headline mistakes beyond our control, but in editorial and production terms I firmly believe we are at very least the equal of any other broadcaster. But it's for the public to judge us, not me. What gets you more excitable these days - is it big Champions League nights, or is the World Cup still the holy of holies? Both, thankfully! The day I turn up for any game without feeling a buzz of excitement, I'll know it's time to pack in. Champions League is the choice of many professionals now as the best standard of football, but nothing mobilises public support or draws viewers like top-class international football. The last World Cup was a better experience than it was a football tournament, but the scale of it remains far greater than anything else in the game. The world watches a World Cup. You've been "reduced to stutters" by stares from Roy Keane. Has anyone else come close in terms of being an intimidating interviewee? Nobody quite as unpredictable. An angry Fergie is a challenge - particularly if you've been instructed to ask him a question you know he won't like. His head tilts to one side halfway through your question and his eyes widen. You end up asking the longest question in broadcasting history, and he offers the shortest answer. Far be it for me to want to dip in to your after dinner speaking routine, but do you have a favourite Brian Moore story? When the late great BM retired in 1998, ITV threw a dinner for him and sat his young(ish) successor down next to him. A couple of bottles of red wine later, he leant over quietly and said to me, 'there are only two things you need to remember.' Frantically I tried to clear my head of grapes and concentrate on the commentating gems he was about to bestow on me. 'Be on time and be warm enough,' he said sagely. My interpretation of that was 'if you're there, and you can speak without your teeth chattering, it's up to you'. He never complicated the straightforward. Were ITV right to sack Big Ron as a co-commentator after his racist outburst against Marcel Desailly. Not my decision, and I would hate to have been the man that had to take it. I know Ron and he is not actively racist. You were commentating the night of the Heysel disaster. Are you still haunted by the events of that day? Haunted would be an overstatement, but I went to Brussels to commentate on a football match and ended up counting the first dead bodies I'd ever seen in my life. It's not something you forget. You've covered a number of other sports in your career. What is your favourite sport other than football? I'm a big golf fan. I'm fascinated by the contrasts between team and individual sports. Playing golf with my 15 year old son is the biggest single pleasure in my life. Be prepared to roll your eyes - do you actually support Manchester United? I was a home and away United fan in the seventies, I think i missed four games in the Second Division season. They were my dad's team, I'm from Bury, and he took me to watch them. But when I started to work in local radio and got to know the Forest players I was reporting on as friends my perspective changed. I'm lucky to have a lot of genuine friends and associates in and around the game, so my primary allegiances are to them and ITV's best interests in any game. England are the only team I feel passionately involved with now. Was 'that night in Barcelona' as good as football gets? It wasn't much of a final until the last ten minutes, but it was a big night for my career. It was the first season after Brian Moore's retirement, and I got to commentate on all the big games in the Champions League and FA Cup campaigns in United's treble. Barcelona produced a memorable finale to that first year, and I got the scorers right, and said a couple of things that United fans still remember. But the extent to which I refer to that game is ridiculously overstated. It's all a bit of a cliche now, and a long, long time ago. You must have been chuffed coming out with the words "....and Solskjaer has won it" at that pinnacle moment? It's woven into the minds of all United fans watching that night on television I'm sure. The best thing I did on the night was to shut up for a few seconds after each United goal. It allowed the moments to speak for themselves and gave me a bit of thinking time. But Solskjaer's goal is what is woven in the memories, not my soundtrack to it. Is it easy to remain impartial as a commentator? Unless England are playing, and then I don't even try. Objective? Yes. Impartial? How? The line "How must Lothar Mattaus be feeling?.....well with the greatest of respect, who cares?" didn't go down too well with my German friends over hear that night. Heat of the moment stuff? People remember these lines better than I do. I don't remember saying it. My biggest soundbite recollection was Fergie's 'football... bloody hell.' Said it all. You have a popualr Twitter account. Is that something you enjoy or is it a bit of a time waster? I honestly don't have time to waste. I value time like little else. Twitter is a modern means of communication, and that's my business. I prefer Facebook because it's more personal and friendly. Do you have any broadcasting ambitions left? I'd love to interview either or both of my children about something they achieve in the future. Good, as ever, Dan. Interesting points by Clive on how important it is as a commentator to know when silence is golden and to remain impartial. Neither of these things do I associate with Clive. Not sure about that Ron Atkinson not being actively racist business though.